Reduce adjuster workloads by streamlining the claim process. Establish a flight plan to capture images and videos in multiple insured locations. Perform under extreme hazardous conditions and in inaccessible locations — all without human intervention. Share and analyze information in real time to make quicker, more knowledgeable, and accurate claims decisions. Obtain close photographs of questionable areas to better analyze the cause of loss without compromising the scene. Use infrared cameras to immediately detect the possibility of water, air, oil, radiation, and gas leaks — a traditionally time-consuming process. Provide field adjusters with instant access to remote specialists who can view videos and photos that are transmitted by drones in real time. According to the Insurance Information Institute, claim fraud makes up nearly 10% of all property and casualty losses in the U.S. and results in an estimated $32 billion — a situation that is getting worse with recent weather-related tragedies. Why? Because after a catastrophic event, insurance companies are typically inundated with calls from policyholders reporting new claims. In these types of situations, having the manpower to inspect every potential loss is virtually impossible. Unfortunately, this can lead to claims being filed for damages that may not be as extensive as originally reported or that may have been in existence prior to the occurrence. Drones are helping combat fraud by piloting over insured properties in real time, surveying and capturing the extent of the actual damage for adjusters to properly adjudicate a claim. Moreover, drones can be deployed to extremely hazardous areas in place of humans to immediately assess property damage claims without having to wait weeks or months. According to PwC’s study on the commercial applications of drone technology, the average annual cost of insurance claims from natural disasters has increased eight times since 1970. The primary reasons for this rise in costs can be attributed to higher property values, growth of population density, and expanded insurance coverage in high-risk areas. Unfortunately, insurers are only able to assess the extent of damage and to accurately measure losses of a natural disaster after the occurrence. While helpful information to have, the process does little to prevent losses. The fact that drones can be sent into even the most treacherous of situations means they can be used to collect valuable data to help better prevent losses before they occur by measuring changes in the landscape in real time. For example, they can be used to monitor roadways that have become treacherous due to snow and ice accumulation and properties located near waterways that are at risk for flood losses during hurricane situations. In these instances, drones can be deployed immediately to collect data to monitor the risk as it develops, including alerting individuals about areas to avoid and possibly evacuate. This data can also be used to help support underwriting processes when establishing property premiums. Drones may be a disruptive technology, but they’re quickly proving their worth by helping insurers build business and technology use cases around drone capabilities, up to and including artificial intelligence (AI) applications. . How do you see drones fitting into your digital road map? Want to know more about how insurers are using drones and other digital solutions today? 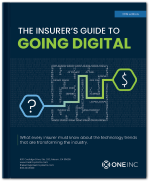 Download the the eBook for the latest tech trends in insurance! Chris Piwinski is a Product Marketing Manager at One Inc, focusing on “what’s now” and “what’s next” in insurance technology.